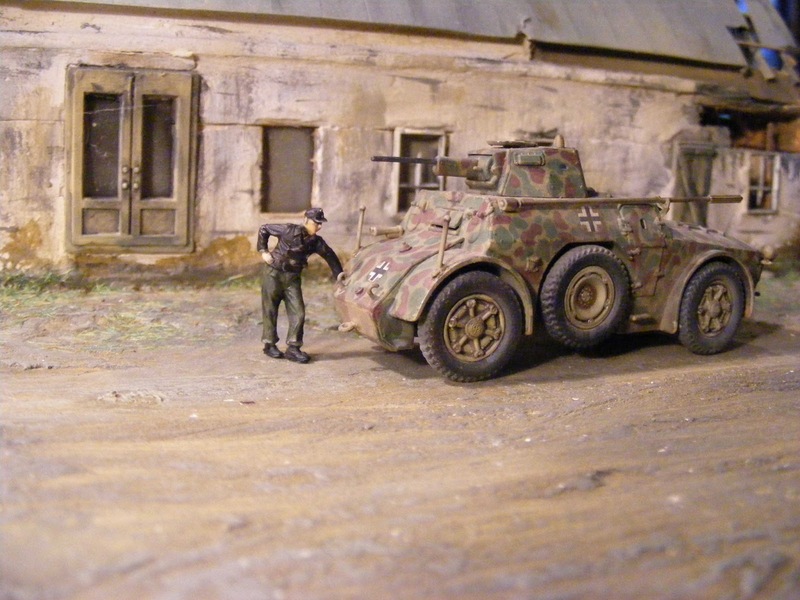 Here is the 2nd in my Italian multiple build, The Italeri AB 41 & 43Armoured Car. I picked the AB 41 kit up on a whim a few years ago, and it has been sitting in the stash pile ever since. Having found many pictures of these vehicles in service in the Balkans inspired me to get the build underway, for a diorama idea. As ny LHS had an AB 43 as well, I decided to pick one up to check the differences between the AB 41 & AB 43. I have no comprehensive reference material on this vehicle, so it will be an OOB build. The kits. Both kits have one sprue of pieces, a set of detailed instructions and a small sheet of decals. The difference is that parts are supplied for a differently shaped and larger turret in the AB 43 and the AB 43 has "rough terrain" patterned tyre tread. One reference on the web advises the AB 43 has a different engine, and slightly wider body. It seems in this scale the difference is negligible (as the web reference advises the difference is barely noticeable in 1/35 scale, it must be twice as unnoticeable in 1/72 scale). At least I hope so. The parts are very crisply cast and the instructions are very detailed and clear. The build. The parts are very easy to remove from the sprues and other than trimming where the sprues were attached, & a few tiny cast lines on some pieces, no clean up is required. The build does require drilling of 5 small holes to attach a couple of pieces to the front plate and one piece on the top plate, and to locate a suspension arm on the underneath. This is is no hassle at all, other than having to study some pictures to assess exactly where to drill the holes. Very little else to say about the build, it was quite straightforward. The turret has hatches that can be affixed open or shut, has interior gun details, and a wheel, in reality its function appears to be to rotate the turret.Nice that its added it may be visible through the open turret hatch. I have not attached several small parts as these will inhibit painting, & will be vulnerable to damage during the painting process. The smaller parts will be painted separately and attached after the main paint job is complete. The tyres lack tread detail. From the box illustration it appears the pattern was quite light but is almost non existent on the kit parts, The tyres in the sister kit (AB 40) have a different pattern of tyres with a much more defined pattern. 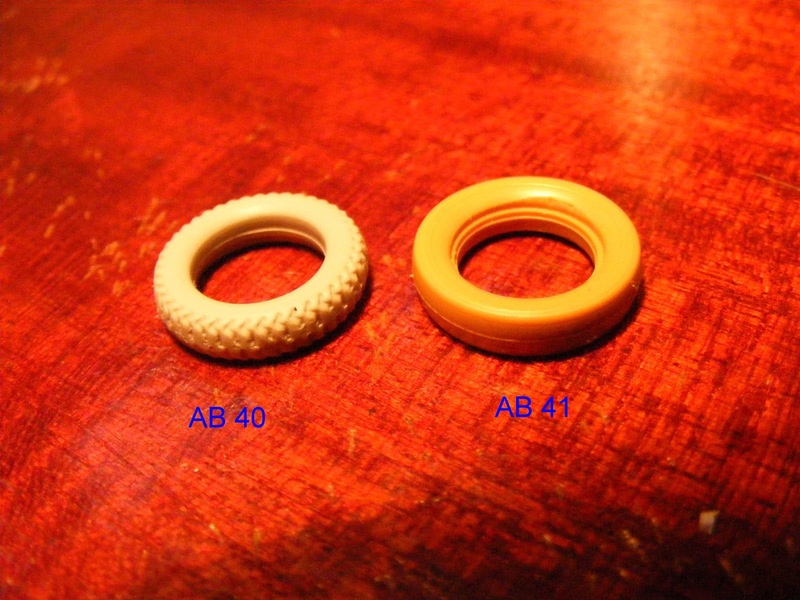 Note that the AB 43 kit has the same improved tyres as the AB 40. As soon as the weather clears I will commence painting of this piece. Updated Sunday 03 February 2013. Both these models were pre shaded with Tamiya Flat Black Enamel, then left to dry for a few hours. A light spray of Humbol Enamel Matt 94 was then applied, heavier to the areas that would normally be in light (the upper areas). Update 03 March 2013. Paintjob on the AB 41 using Lifecolor Red Brown and Olive Green, then Citadel Nuln Black wash, and light spray of Modelmaster Italian Sand. AB 43, green used is Modelmaster Italian Olive Green, then wash of diluted Citadel Nuln Black, then very light over spray with Italian Desert Sand.